KATIE: Hi everyone, Katie here with a late-breaking SPECIAL REPORT. The security threat level is now 9 at the Townhouse. This unprecedented status level indicates a serious and possibly CATtastrophic threat is imminent. House guests arrive this evening at 1800 hours. KATIE: Waffles! Are you at your post? WAFFLES: Um, copy that Boss. KATIE: Waffles! Conduct a perimeter sweep and check for hostiles. WAFFLES: Um, Boss? The purr-imiter is clear. But you're kinda hostile...does that count? KATIE: Waffles! This is no time for rookie mistakes. What's your 20? You're not laying down on the job again are you? WAFFLES: Um. No? I'm still sweeping the purr-imeter. Over. KATIE: P.S. Contrary to popular opinion, Waffles Too was NOT eating spaghetti in yesterday's post. It was shredded chicken. Hold the red sauce. Whew! 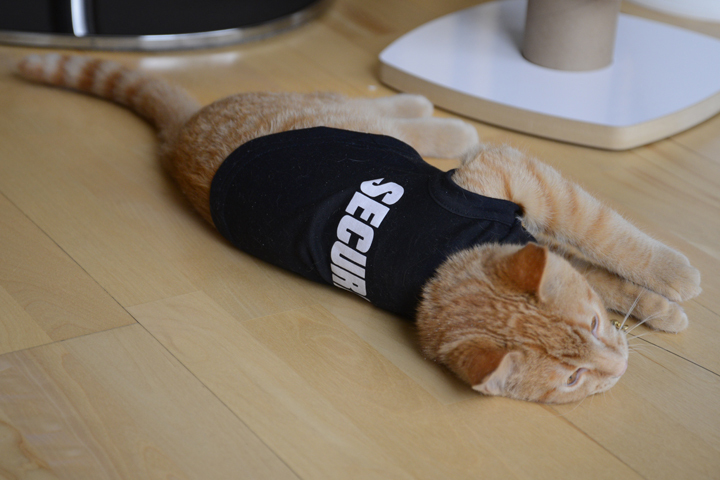 Security is hard work. We are voting regularly. Maybe you could visit my blog and vote for the prom contest if you have a minute? It's on my sidebar...I (and the kids of my sister in laws's school) would appreciate it. FaRADaY: Seriouslies. The way to deal with intruders is to come down while they're in the middle of serious human conversation and YOWL YOUR LUNGS OUT. WHADDAYA MEAN there's Passover video of it?!?! No DNA, no proof. Oh my gosh I LOVE Waffles' shirt! It doesn't look like he minds wearing it too much in the pictures either. Katie, judging the way Waffles Too is guarding the purrimeter, you better go UTB right now and start warming up the hissing motor! Katie, I get the feeling that when these guests show up, you will be UTB and Waffles will be hanging out with them and they will think Glogirly and Gloman only have ONE kitty! Ok Katie, YOU look fierce in your uniform. But Waffles Too! too cute to be feared! I hope there's no hostiles..
Oh no incoming intruders. They better bring treats we say. Keep sweeping the purrimeter as you never what else might get in? Have a terrific Thursday. Looks like Waffles fell short of his completing his duties. Waffles looks like he's falling down on the job. Better put some provisions UTB, Katie, before those introoders get there. Serious business going on over there. Pardon me if I laughed out loud. I will put on a serious face and wish good luck with the intruders! nice uniform, waffles! katie, you look great on that! Good luck you guys! And don't let your guard down! Did you say Spaghetti and Chicken? I will have to check out yesterday's post ASAP! Katie, I surely wouldn't pass you in your security gear! But I think you should know that Waffles isn't taking is position very seriously. In fact, I'd bet he's planning on acting as a double agent with the intruders! It's been a pleasure voting for you two cuties. Waffles no sleeping on the job, HOUSEPEST can be dangerous. You can come and hide out at mine if you like? wadda ya meen ya wuz knot eatin sghetti..
Good luck to Taem Secure. Hey Katie, Waffles has it all covered! It's good to know you two are on the alert. Katie, remember no matter how many times Waffles Too gets attention, you're still the best. Happy Easter, friends. Katie, you got W2 a really cute shirt and he's laying down on the job!!!! It's so hard to get good help. Pop is now unemployed so maybe he could work for you. 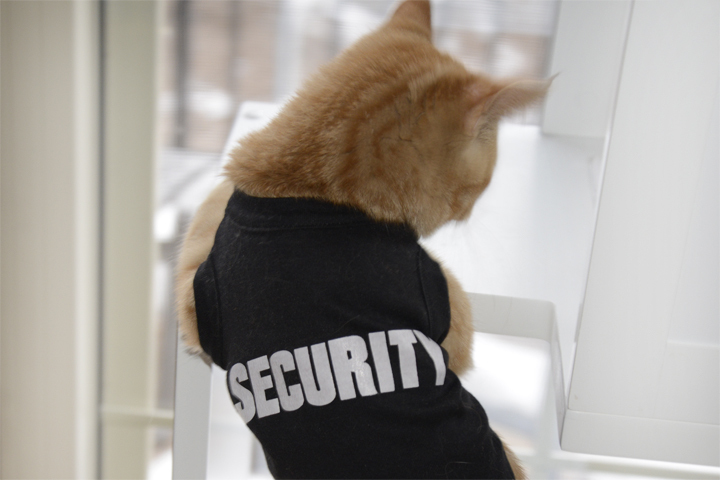 We love your official security gear!!! 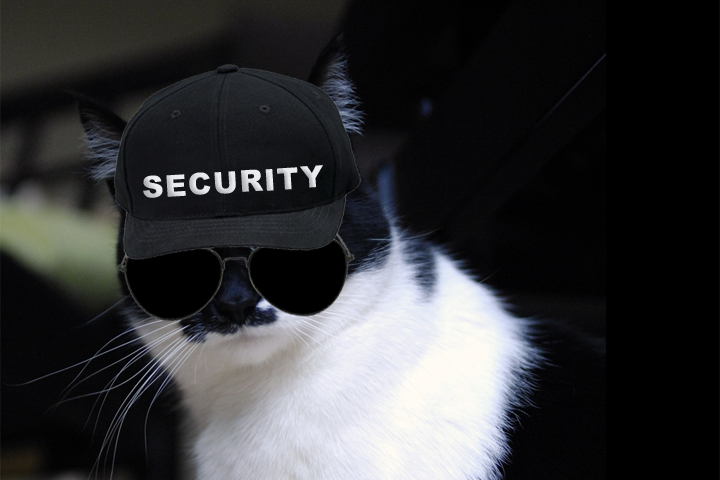 Katie, I think you need another security guard. Waffles just isn't cutting it. Want me to come over to help secure the place?? You guys make quite a team!! Ah! Does yous hold the fort under the bed too? 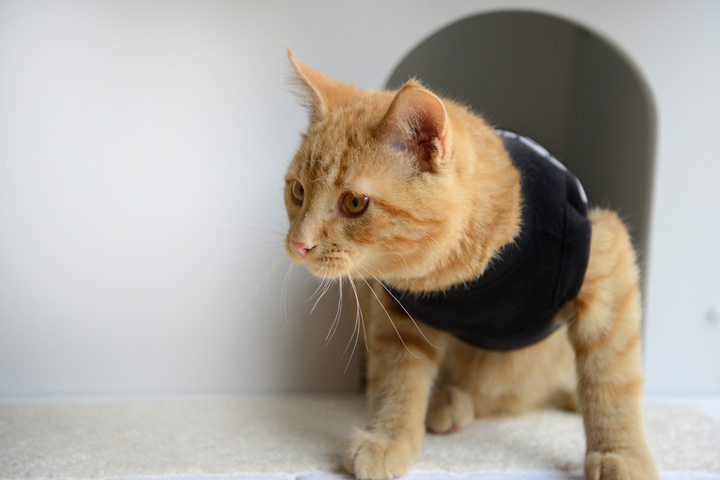 Awwww, Waffles too looks so darling and adorable--uh, I mean fearsome and frightning-- in his sweet little--uh, I mean official and intidating--black uniform shirt. So tell me if you figure out a way to keep them out cause I could use a few tips. oh goody! I need a bouncer for my pawtah. you two seem like professionals. i can pay you in catnip and all the freeze-dried mice you can eat. just keep the really nippy cats away from teh talent. roger ova an out. wut eva that means.